HONG KONG - FEBRUARY 19, 2015: Belly dance group at night parade ceremony, dancing performance for watchers, woman with cotton in hands, showing dance skills and grace. Chinese New Year celebration. 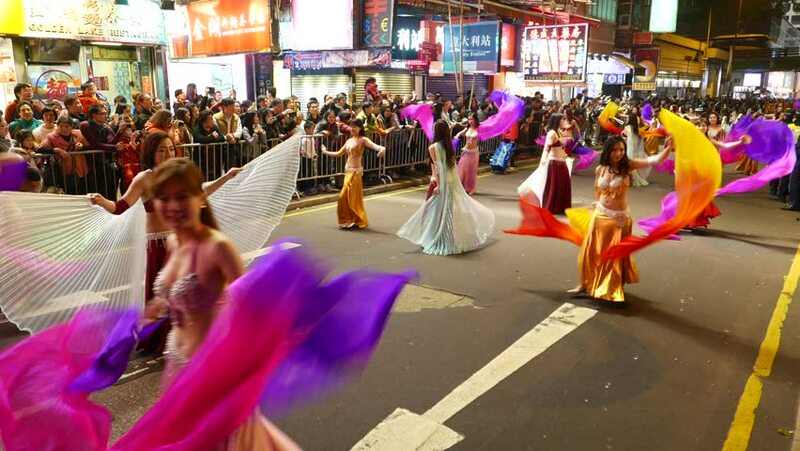 4k01:00HONG KONG - FEBRUARY 19, 2015: Belly dance parade performance, Chinese New Year celebration at night street. Team of women and one man performing belly dance during walking across the street. 4k00:32HONG KONG - FEBRUARY 20, 2015: Belly dance school performance on night street during festival procession, annual Chinese Lunar New Year public celebration parade in Hong Kong city. 4k00:17HONG KONG - FEBRUARY 19, 2015: Chinese man dancing belly dance, walk with night parade procession, New Year celebration at HongKong city. Spectators crowd on roadside behind steel fence. hd00:20HO CHI MINH CITY, VIETNAM - MARCH 22, 2016: Cars and motorcycles pass by the night shops on the street at night on March 22, 2016 in Ho Chi Minh City, Vietnam.